Celiac.com 01/15/2019 - The annual Girl Scout cookie season is kicking off for 2019 with some fresh new cookies, including the gluten-free Caramel Chocolate Chip. The Scouts’ newest treat is flavored with semi-sweet chocolate chips, caramel and a hint of sea salt. The gluten-free Caramel Chocolate Chip cookie is the first new Girl Scout cookie since their popular S’mores was introduced in 2016, and the first new gluten-free cookie since the Girl Scouts first introduced gluten-free cookies nationally in 2015. Each Caramel Chocolate Chip cookie has just under 60 calories, 4 grams of sugar and just under 3 grams of fat. Other traditional Girl Scout favorites include Thin Mints, Do-si-dos, Samoas and Trefoils. The Girl Scouts have two other gluten-free offerings: Toffee-tastic, a buttery cookie with sweet and crunchy golden toffee bits, and Trios, a peanut butter oatmeal cookie with chocolate chips. The Girl Scout Cookie Program is committed to promoting entrepreneurial and business skills in girls. 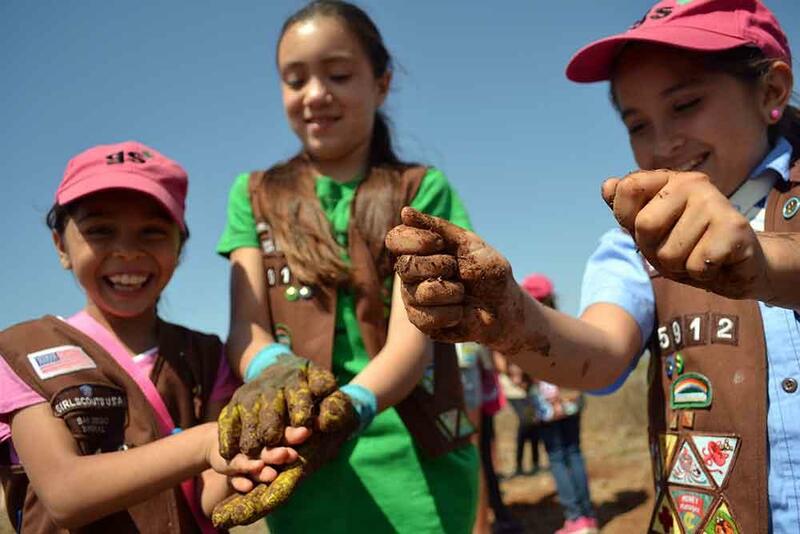 According to a statement by Girl Scouts of the USA CEO Sylvia Acevedo “…all Girl Scout Cookie proceeds stay local to power year-round troop projects and activities, when you buy Girl Scout Cookies, you are making an investment in girls and in your local community." 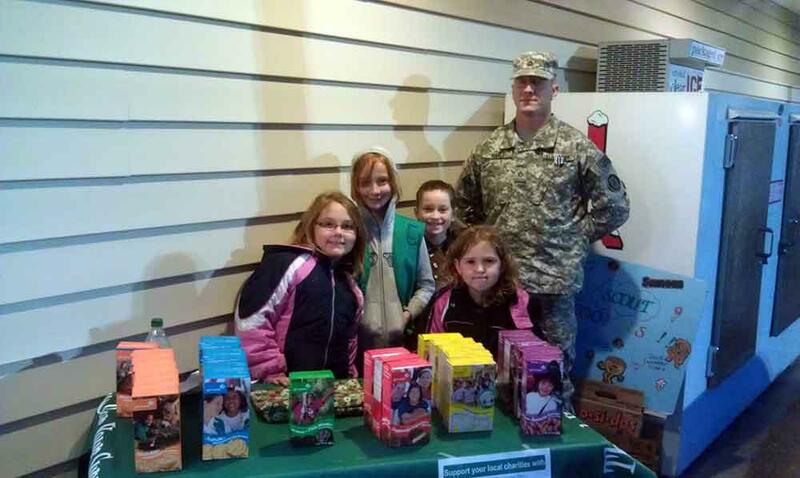 Cookies prices may vary regionally, as they are set individually by each of the local 112 Girl Scout councils. To buy Girl Scout cookies, including their newest gluten-free Caramel Chocolate Chip, download the Girl Scout Cookie Finder app or go to Girlscoutcookies.org and enter your zip code. Have you tried the Girl Scouts’ new gluten-free Caramel Chocolate Chip or other gluten-free cookies yet? If you do, please chime in and let us know your thoughts. Celiac.com 09/19/2018 - Great news for gluten-free cookies lovers! Girl Scouts has announced the debut of a new gluten-free cookie to its enormously popular cookie brand. The new Caramel Chocolate Chip is a chewy cookie that contains caramel, semi-sweet chocolate chips, and a hint of sea salt. also happens to be gluten-free. The new gluten-free treat will be available in select areas during the 2019 cookie-selling season; which typically runs from February to April each year. The gluten-free Caramel Chocolate Chip joins the Girl Scouts’ two other gluten-free offerings: Toffee-tastic, a buttery cookie with sweet and crunchy golden toffee bits, and Trios, a peanut butter oatmeal cookie with chocolate chips. The Girl Scouts of America has been around for over 100 years and now hosts more than 1.8 million girl members. 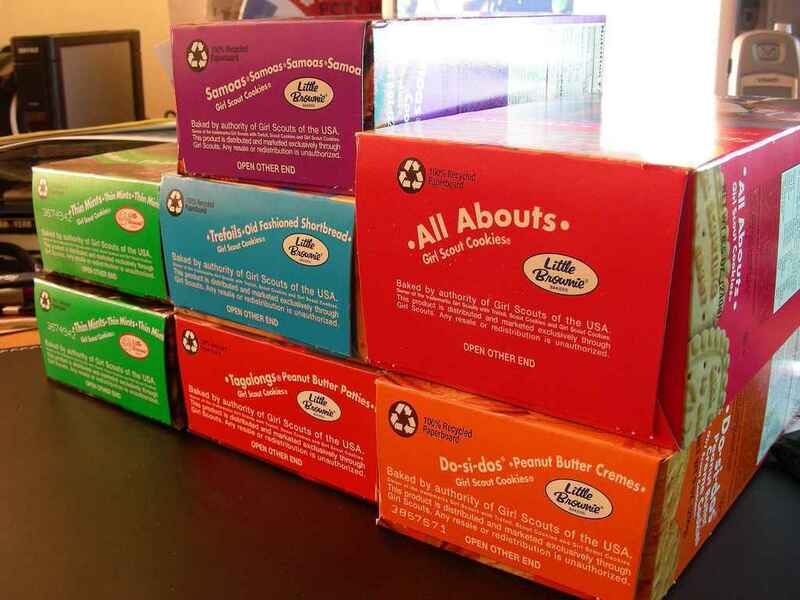 Every year, about 100 million scouts between the ages of five and 18 sell approximately 200 million boxes of cookies nationwide. According to the Girl Scouts website, that money stays local to develop local leadership training activities, summer camps, and more activities. According to a 2016 study conducted by the Girl Scout Research Institute, approximately 85% of Girl Scouts surveyed said that Girl Scout Cookie Program helped them learn how to set goals and meet deadlines, while 88% said it helped them become effective decision-makers. Another 88% said they learned how to manage money, while 94% said the program helped them to learn business ethics. The Girl Scouts have also added online sales and iOS and Android apps that allow people to find cookies or order from their phones. Celiac.com 12/13/2016 - Cookie exchanges are fun social occasions but let's resolve to make cookies healthier next year. They don't need to be 7 layer high fat, high sugar indulgences that contribute to many chronic diseases like diabetes, high blood pressure, cardiovascular damage and dementia. Yes, high sugar is now identified as a major contributor to dementia and even has its own classification called Type 3 diabetes. As the levels of obesity and diabetes continue to generate headlines, emphasis on reducing sugar will continue to make news. Stevia now has a global market over $300 million as a sugar substitute but it continues to lag behind other sugar substitutes in the U.S. Stevia leaf has been valued for centuries throughout South America for its sweetening properties. It is about time Americans started using a healthier sugar substitute that the Japanese have enjoyed for decades. Using sugar substitutes like stevia, erythritol and xylitol can modify calories without sacrificing taste. These sweetening agents are better choices than the other sugar substitutes used in sugar-free foods. Whole grain gluten-free flours like hemp and quinoa provide more protein, fiber, calcium and iron than whole wheat so gluten-free cookies are healthier than conventional choices. These flours impart a nutty taste to delight any appetite. Quinoa is the Andean cereal that originated in the Ecuador, Bolivia, Columbia and Peru region of South America. Quinoa and hemp are both becoming increasingly popular throughout the United States and are available in most health food stores. What was once considered "peasant food" now sells for a higher price per pound than chicken! Quinoa flakes are easy to use in cookies, yogurt or soups for added protein and nutrients. Butter and coconut oil add the most calories to each cookie. Don't pay any attention to all those negative comments about saturated fat content of butter and coconut oil. There is no science to demonstrate they are unhealthy. Coconut oil is made unhealthy when hydrogen is added to the oil to make non-dairy cream or whipped toppings. Theron Randolph, M.D. described it best when he stated "analytical dietetics" (what can be assessed by a machine) is not "biological dietetics" (how food is used in your body). Many recipes and commercially baked products contain xanthan gum to make the dough more sticky. This recipe does not use of xanthan gum because it is derived from the fungus, xanthomonas campestris (the black mold on broccoli, cauliflower or leafy greens). This fungus is grown on corn, wheat, dairy or soy to produce the powder. Since no studies have been done about sensitivities to xanthan gum produced from these foods, anyone with sensitivities to these foods should limit or avoid products that do not state the source for the production of xanthan gum. Remember, it is a thickening agent that can be present in many foods like salad dressings, ice cream, egg substitute products, etc. As a thickener, xanthan gum is a very effective laxative This one basic cookie recipe can provide lots of variety for health snacks throughout the coming year. Cookies can provide a quick snack so numerous options mean healthy eating for everyone. Chocolate Chip Quinoa Cookies Ingredients: 1/4 cup coconut oil 1/2 cup butter or margarine 3/4 cup Xylitol sweetener or 3 tablespoons stevia- erythritol sweetener 2 eggs 3/4 cup brown rice flour or hemp flour 3/4 cup coconut flour 1/4 teaspoon salt 1 1/2 teaspoon baking soda 1/2 cup quinoa flakes or hemp hearts 1 cup (6 oz) chocolate baking chips 2 tablespoons water Directions: Cream together coconut oil, butter, sweetener and eggs. Add rest of the ingredients and mix thoroughly. Drop by teaspoons onto lightly oiled baking sheet. Press down and bake in 350 degree oven 10-12 minutes, or until browned. Makes 3 dozen. To make Oatmeal Spice Cookies: add 1 teaspoon ground cinnamon, 1/4 teaspoon ground nutmeg and 1/8 teaspoon ground cloves instead of chocolate chips. To make Hemp Raisin Cookies: add 1/2 cup raisins instead of chocolate chips and use hemp flour To make Peanut Butter Cookies: add 1 cup peanut butter to creamed mixture. Top with chocolate chip, if desired. 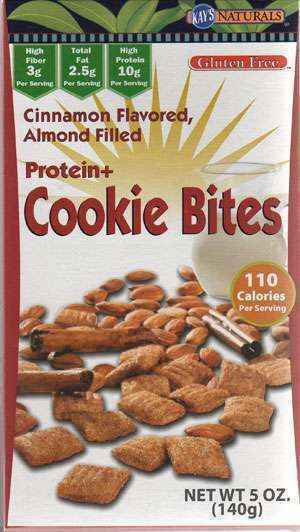 Calories per cookie: 158; Protein: 3 g; Carbohydrates: 16 g; Fat: 8 g, Sodium: 69 mg. If you want peanut butter that has the consistency of a soda fountain milkshake—not too thick but not too thin—this is it. I could not get enough of the Cookie Nookie flavor. It has just the right amount of sweetness thanks to a lovely combination of sugar, honey, and vanilla. 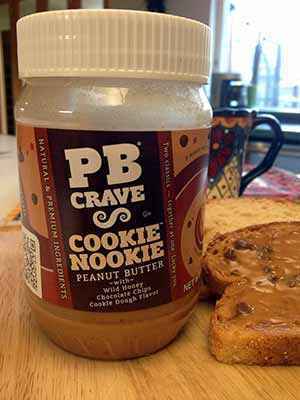 For a great treat anytime, I highly recommend Cookie Nookie Gluten-Free Peanut Butter. Just make sure the adults in your family keep their supply away from the kitchen pantry that is shared with the kids during the upcoming school holiday vacation! For more information, check out: www.pbcrave.com. Review written by Patricia Seeley. Here's a recipe for gluten-free cookie clusters. They’re delicious as a dessert, but depending on how much of a sweet-tooth you have, they could even serve as a good breakfast snack/pastry! One of the things I like about this is that the recipe comes from a naturopathic dietician who has been able to work the "Konsyl Original" fiber supplement directly into the recipe itself. This is especially great if you have kids with celiac, who may need nutritional supplements like fiber, but have to be wary of gluten. The recipe is flexible, so if you’re feeling particularly adventurous in the kitchen, you might even try adding in your own favorite ingredients or taking any out to accommodate even the pickiest of eaters! 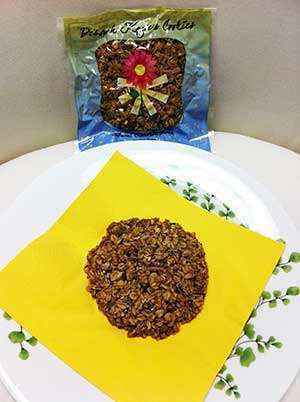 And best of all, the end result is a dessert that will give you the fiber you need, in a form you love. After all, who doesn’t want a cookie? Particularly with these ingredients...brown sugar, almonds, dried fruit (or any substitute of your choice), and maple syrup. Ingredients: 2 cup rolled oats 1/2 cup Konsyl Original psyllium fiber 2 tablespoons brown sugar ¼ teaspoon salt 1 cup or more of any of the following: walnuts, almonds, pecans, Brazil nuts or any other nut, coconut flakes, dates, raisins, dried cherries, dried cranberries or any other dried fruit 1/4 cup maple syrup 3 tbsp coconut oil or melted butter 1 tablespoon water 2 teaspoons cinnamon 1 teaspoon vanilla extract Directions: Preheat oven to 325 F. Spray a 9x13 cookie sheet. Mix oats, Konsyl, sugar, salt and nuts (reserve dried fruits for later). Bring syrup, oil, water, cinnamon and vanilla to a low simmer in a sauce pan. Drizzle on oat mixture and stir. Pour onto cookie sheet, squeezing and pinching to make clusters. Bake 20 minutes. Stir and add in dried fruit. Bake 5 more minutes. Cool and store in an airtight container. When I first opened the package of Squirrel’s Bakery Gluten-Free Coconut and Chocolate Chip Cookie Bars I was surprised by their unique shape: The package contained two bars that are approximately 2.5” x 3” and they are around an inch thickÂ­so they resemble a brownie in size and shape. They aren't kidding when they use the terms “thick & hearty” to describe these cookie bars. In addition to being gluten-free, Squirrel’s Bakery thick & hearty cookie bars are also soy, dairy and nut-free, so they will appeal to those of you who have additional food intolerances or allergies, as well as to those who have celiac disease. The bars are made using quality ingredients like Bob’s Red Mill gluten-free oats, organic brown rice flour and Enjoy Life gluten, soy, dairy & nut free chocolate chips, and they are also a good source of fiber, iron, calcium and protein (the bars do contain eggs). The first thing I noticed when biting into the Squirrel’s Gluten-Free Coconut and Chocolate Chip bar is the large coconut flakes, which tasted wonderful. This taste was enhanced by the wonderful combination of their allergy-friendly chocolate chips, along with their blend of gluten-free flours and oats. The texture was very nice, it was not too moist and not too dryÂ­I’ve never been a fan of overly-soft cookies or bars. The last question that must be answered about this excellent gluten-free “cookie”: Could I get used to eating “cookie bars” instead of regular old cookies? Sure…I really can't imagine anyone who would not enjoy these special treats! They should please the most die hard cookie lovers, and offer a unique take on a traditional treat. 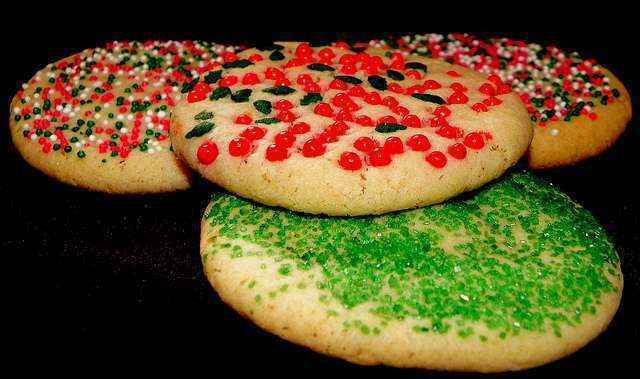 Squirrel’s Bakery is a small family owned cookie manufacturing business based in Virginia Beach, Virginia and was founded in 2009. For more information, you can visit their Web site at www.squirrelsbakery.com. Note: Articles that appearin the "Gluten-Free Product Reviews" section ofthis site are paid advertisements. For more information about this seeour Advertising Page. Over the weekend my wife made a batch of Doodles Cookies Gluten-Free Chocolate Chip Cookie Mix. This gluten free cookie mix is very easy to prepare, and the gluten free cookies were ready in about 45 minutes, from start to finish. We ended up with around two dozen very tasty chocolate chip cookies. On top of their great taste, Doodles Cookies are all-natural and organic, and contain whole grain oat and brown rice flours as their base ingredients. My entire family, including my two kids, really liked these cookies and would recommend them to anyone on a gluten-free diet...or not! For more info visit their Web site at: www.doodlescookies.com. Note: Articles that appearin the "Gluten-Free Product Reviews" section ofthis site are paid advertisements. For more information about this seeour Advertising Page. ½ cup gluten-free butter or margarine 2/3 cup sugar 3 eggs 2 cups Bette Hagmans 4 Flour Blend ½ teaspoon xanthan gum 1 teaspoon baking powder 1 teaspoon gluten-free vanilla pinch of salt Melt butter or margarine on a low heat in a small sauce pan. Beat eggs in a large bowl and add vanilla. Add sugar to the egg mixture and beat well. After butter has melted, allow to cool slightly and then add to egg and sugar mixture. Sift in flour and baking powder into the wet mixture, stirring well to ensure all flour is completely mixed. Bake using pizzelle iron. Makes about 2 dozen. This recipe comes to us from Sue DeVries. 3 parts brown rice flour 1 part potato flour (not potato starch flour) I use this flour mix for all of my old recipes from the days before I had to eat gluten-free. My cookies turn out great!